So much yarn, so little time. : Did you know Caterpillars go camping? 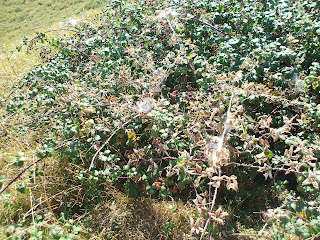 Walking in Rye Nature reserve this afternoon, I spotted lots of webs in a blackberry bush. 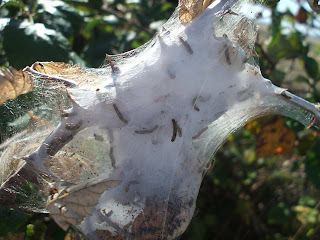 At first I thought they were spiders' webs, but on closer inspection they were filled with lots of tiny caterpillars that are quite happy, not prey at all. 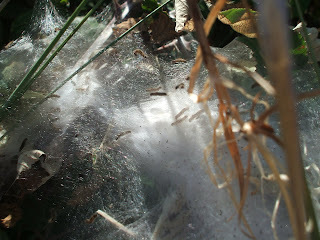 Google suggests they are tent caterpillars, but do you know more? Wow - never seen that before! I am sure that the all-knowing Google must be right! How lovely - not seen these before, either. Thank you - the kids will want to go hunting for them now! (in a good way! ).